I don't know how most of you access this page - whether or not you've bookmarked directly to this portion of my site, or if you come in through the root URL, highwaygirl.com. If you've linked directly to this page, you may have missed the facelift that I gave the home page this evening. Well, actually, it was a joint effort. Eric and I spent the better part of two hours working on it. Unfortunately (or maybe fortunately) we're both total perfectionists when it comes to things like this. The bulk of the work was done within a half hour or so, but then we spent the rest of the time tweaking it and making sure it was absolutely letter perfect. I have to admit - I am in love with it. I think it looks so much more inviting and warm and dynamic. There's a sense of movement in it, whereas the original version was much more static in comparison. Eric gets most of the credit, though. He found the photo, and came up with the idea to use three unequal panels (since the main portion of the road was on the right side). 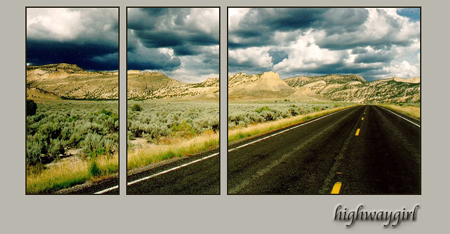 He also did the actual splicing of the photo, and in a triptych like this that is really the most difficult part. I only tweaked the code, did a little cropping, and redid the small "highwaygirl" logo at the bottom. The finished product is about 65% Eric's work and 35% my own. Still - we make a damn good team. The dueling perfectionism paid off nicely, I think. Very nice, hwg & Eric. I love the way time just passes when immersed in a Photoshop (or web) project. I am totally digging the new picture - it's gorgeous! OK, I'm a lameass. Sorry for the double post. Thanks for the positive feedback! I'm quite pleased with how it turned out too. Spiffy! I like the photo, too. Nice job. Nice pic, to be sure. Ultimately, just where does this highway lead? Is this the "Road to Hell", as Chris Rea describes? ohh very nice, just leads the eye so nicely. very cool!